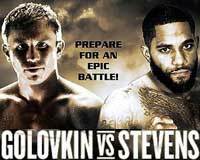 Review: 2013-11-02, good fight with one knockdown: Gennady Golovkin vs Curtis Stevens gets three stars. The undefeated Gennady Golovkin (27-0-0, 24 KOs=89%) entered as the No.2 middleweight in the world while Curtis Stevens (25-3-0, 18 KOs=72%) entered as the No.13 (currently the #1 in this weight division is Sergio ‘Maravilla’ Martinez). ‘GGG’ Golovkin vs Stevens is valid for the WBA and IBO middleweight titles. Watch the video!